9.35% L&T Finance NCD – Mar'19 – Should you Invest? 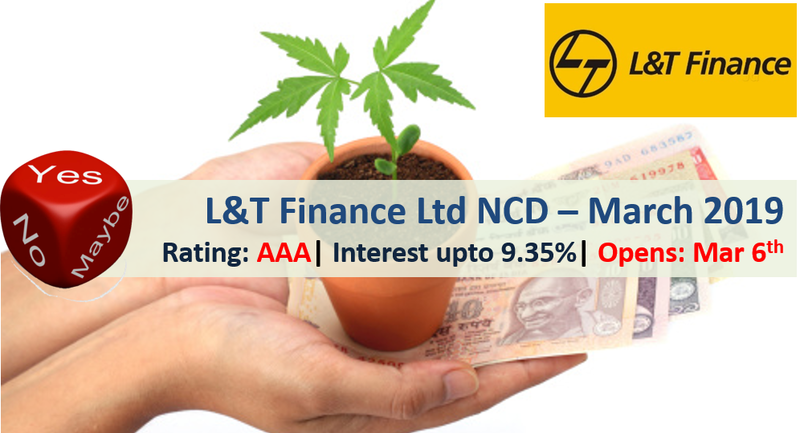 L&T Finance Limited is one of the leading private non-banking financial services companies in India and part of the larger conglomerate L&T Group has come out with public issue of non-convertible debentures (NCD) offering up to 9.35% interest rate. The issue would open on March 6, 2019. Its primary financing business segments are rural, wholesale and housing. There are 6 options of investment in L&T Finance NCD. I am a novice in this area. But, could you please tell me what do you mean by “secondary market”? Where can one access the secondary market? Is there any websites? Secondary market is stock exchange (where you can buy through demat account) while primary market is when you buy directly through the issuing company.